SPECIAL CLOSE-OUT! WOW! ONLY ONE LEFT! 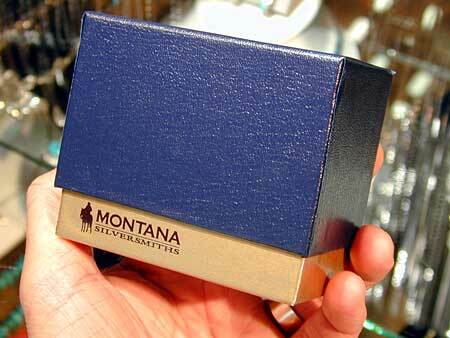 Horseshoe Heart Watch by Montana Silversmiths. Elastic expansion watch band with links that can be added or removed for the just-perfect fit. Click image to enlarge. Water restant electronic quartz timepiece. Hand finished in USA of rugged, electroplated silver and gold. Ships in 1 - 14 days. The Horseshoe Heart Watch arrives in an attractive gift box, ready for presentation or gift giving. Gift wrapping is also available (see above). The proprietary MONTANA ARMOR electroplate finish of Montana Silversmiths watches -- including the Horseshoe Heart Watch -- will not tarnish. They are die-struck from hand engraved masters and the finish is applied by hand by skilled American craftsman. These are true heirloom watches, built for generations.